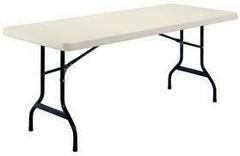 6 foot folding banquet table rentals. These are a mix of sturdy commercial plastic top and wood folding tables, easy to clean and can hold up to any party. No mess no worries when you have guest that accidentally spill foodd or drink. We serve Tampa with our Banquet table rentals. a min order of 65 for customer pick up.